cool cats | What's In John's Freezer? Last year on Darwin Day I debuted “Better Know A Muscle” (BKAM), which was intended to be a series of posts focusing on one cool muscle at a time, and its anatomical, functional and evolutionary diversity and history. A year later, it’s another post on another muscle! Several dozen more muscles to go, so I’ve got my work cut out for me… But today: get ready to FLEX your myology knowledge! 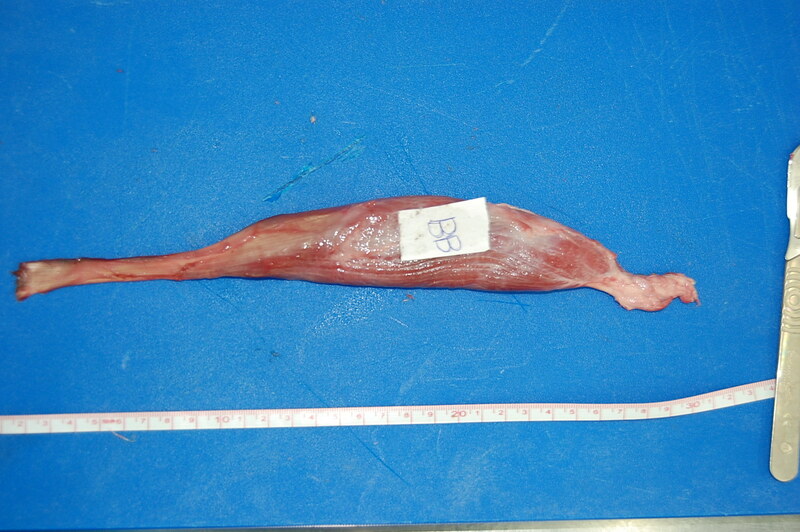 Our subject is Musculus biceps brachii; the “biceps” (“two-headed muscle of the arm”). Beloved of Arnie and anatomists alike, the biceps brachii is. Let’s get pumped up! Stomach-Churning Rating: 7/10. Lots of meaty elbow flexion! Most of the humerobrachialis muscle (purplish colour), in dorsal (top) view of the right forelimb of the fire salamander Salamandra salamandra (draft from unpublished work by my team). In all other tetrapods; the amniote group (reptiles, mammals, etc. 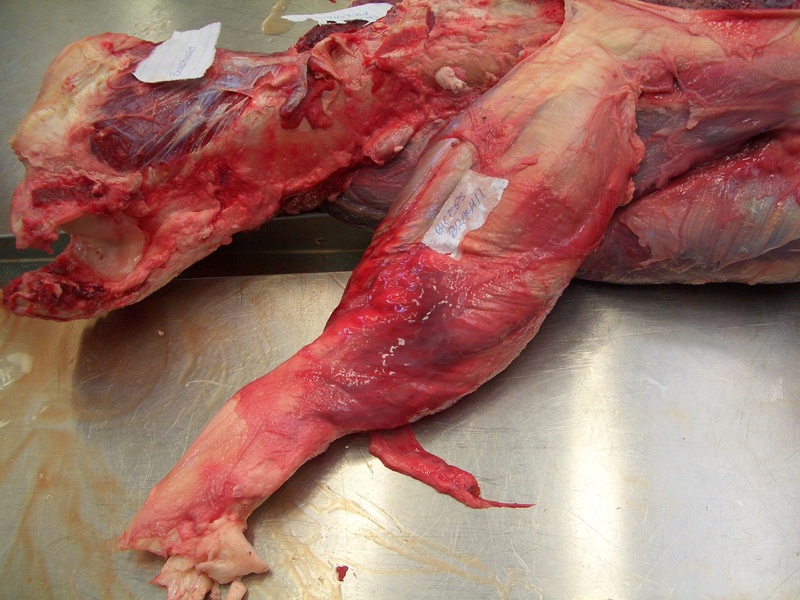 ); there is a separate biceps and brachialis, so these muscles split up from the ancestrally single “humeroantebrachialis” muscle sometime after the amphibian lineage diverged from the amniotes. And not much changed after then– the biceps is a relatively conservative muscle, in an evolutionary (not political!) sense. In amniote tetrapods that have a biceps, it develops as part of the ventral mass of the embryonic forelimb along with other muscles such as the shorter, humerus-originating brachialis, from which it diverges late in development (reinforcing that these two muscles are more recent evolutionary divergences, too). Biceps brachialis or humerobrachialis, the “biceps group” tends to originate just in front of the shoulder (from the scapula/coracoid/pectoral girdle), running in front of (parallel to) the humerus. It usually forms of two closely linked heads (hence the “two heads” name), most obviously in mammals; one head is longer and comes from higher/deeper on the pectoral girdle, whereas the other is closer to the shoulder joint and thus is shorter. 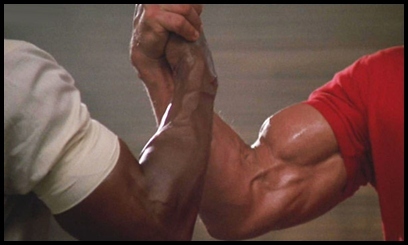 The two heads fuse as they cross the shoulder joint and we can then refer to them collectively as “the biceps”. It can be harder to see the longer vs. shorter heads of the biceps in non-mammals such as crocodiles, or they may be more or less fused/undifferentiated, but that’s just details of relatively minor evolutionary variation. The biceps muscle then crosses in front of the elbow to insert mainly onto the radius (bone that connects your elbow to your wrist/thumb region) and somewhat to the ulna (“funny bone”) via various extra tendons, fascia and/or aponeuroses. 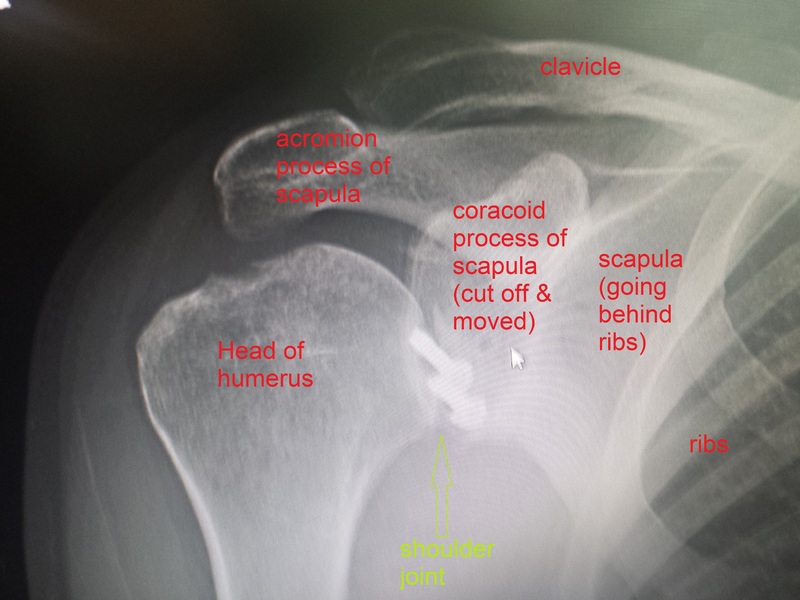 The origin from the shoulder region tends to have a strong mark or bony process that identifies it, such as the coracoid process in most mammals (I know this well as I had my coracoid process surgically moved!). The insertion onto the radius tends to have a marked muscle scar (the radial tuberosity or a similar name), shared with the brachialis to some degree. A nice thing about the biceps is that, because it may leave clear tendinous marks on the skeleton, we sometimes can reconstruct how its attachments and path evolved (and any obvious specializations; even perhaps changes of functions if/when they happened). Crocodile’s right forelimb showing the huge pectoralis, and the biceps underlying it; on the bottom right (“BB”- click to embiceps it). Crocodile left forelimb with biceps visible (“BB”) on the left. 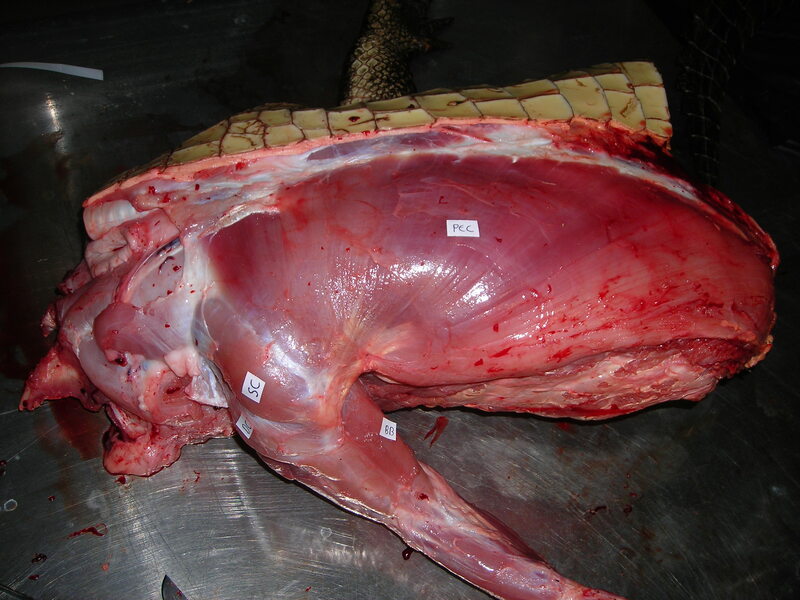 Crocodile biceps muscle cut off, showing the proximal (to right) and distal (to left) tendons (and long parallel muscle fibres) for a typical amniote vertebrate. What does the biceps muscle do? 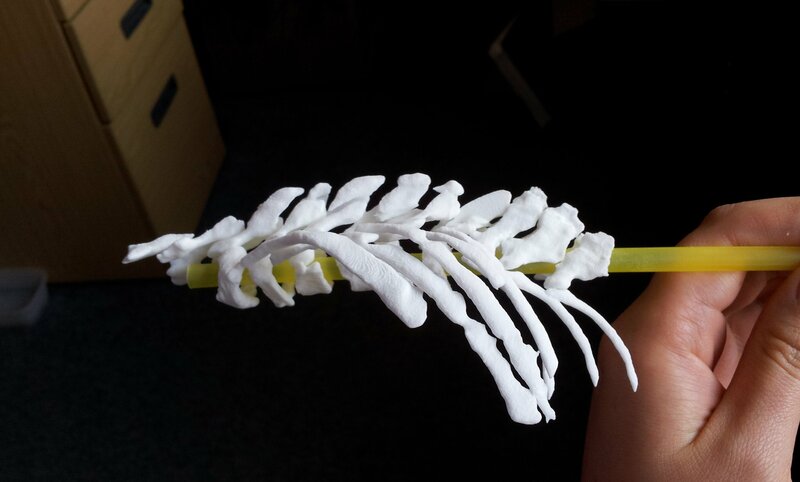 It flexes (draws forward) the shoulder joint/humerus, and does the same for the elbow/forearm while supinating it (i.e. rotating the radius around the ulna so that the palm faces upwards, in animals like us who can rotate those two bones around each other). In humans, which have had their biceps muscles studied by far the most extensively, we know for example that the biceps is most effective at flexing the elbow (e.g. lifting a dumbbell weight) when the elbow is moderately straight. 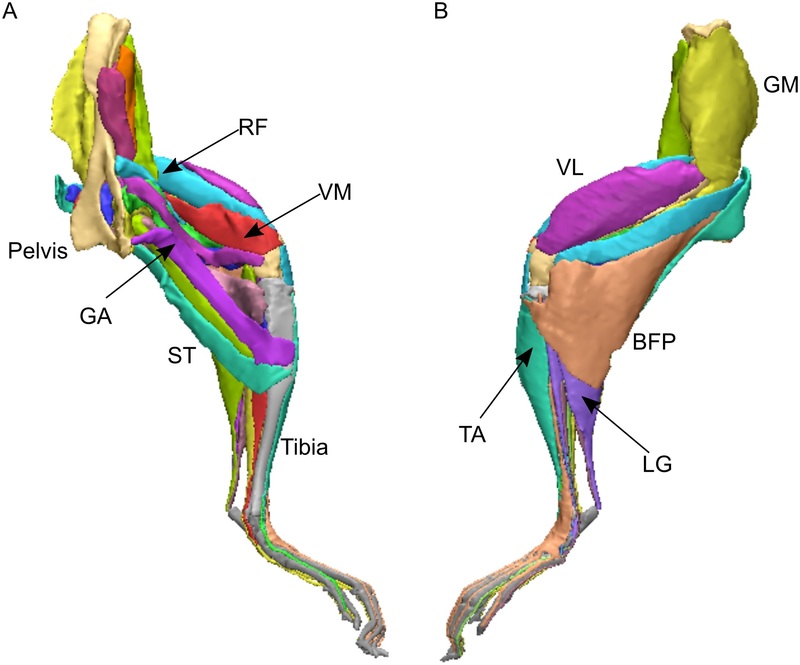 These same general functions (shoulder and elbow flexion; with some supination) prevail across the biceps muscle of [almost; I am sure there are exceptions] all tetrapods, because the attachments and path of the biceps brachii are so conservative. Hey mammals! Show us your biceps! 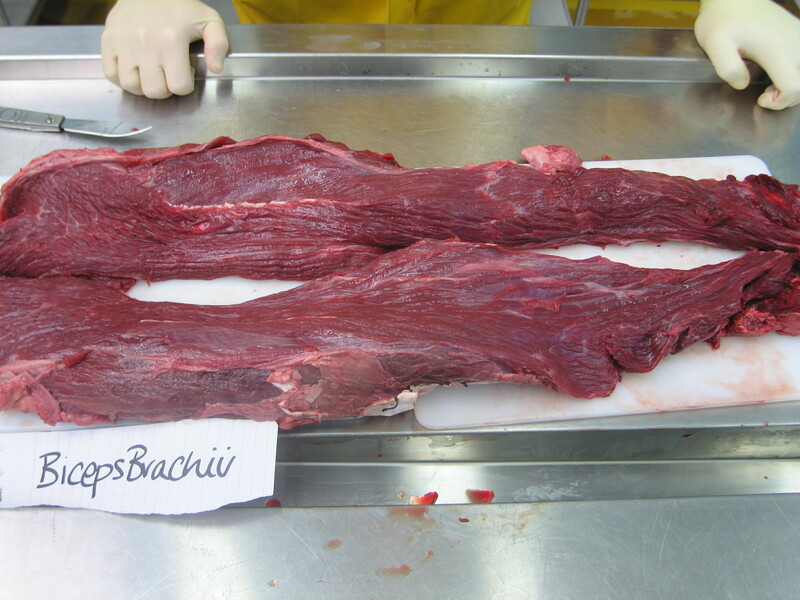 Jaguar forelimb with biceps peeking out from the other superficial muscles, and its cousin brachialis nicely visible, running along the front of the forearm for a bit. 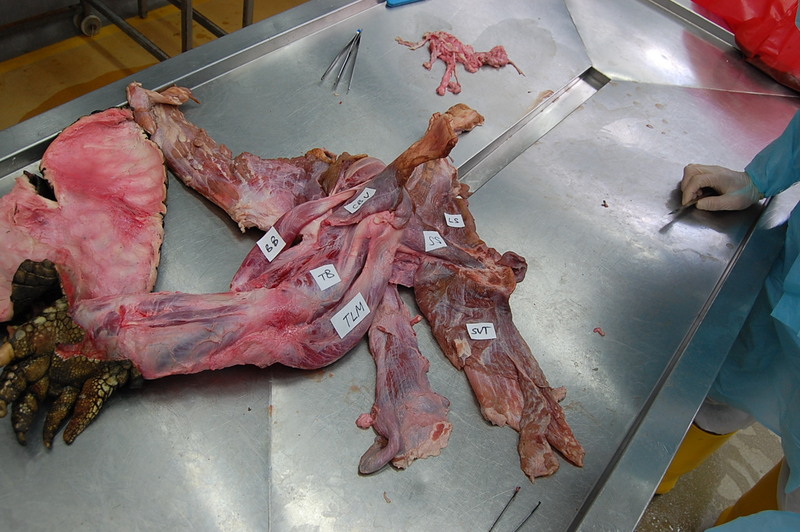 Elephant’s left forelimb with the biceps labelled. 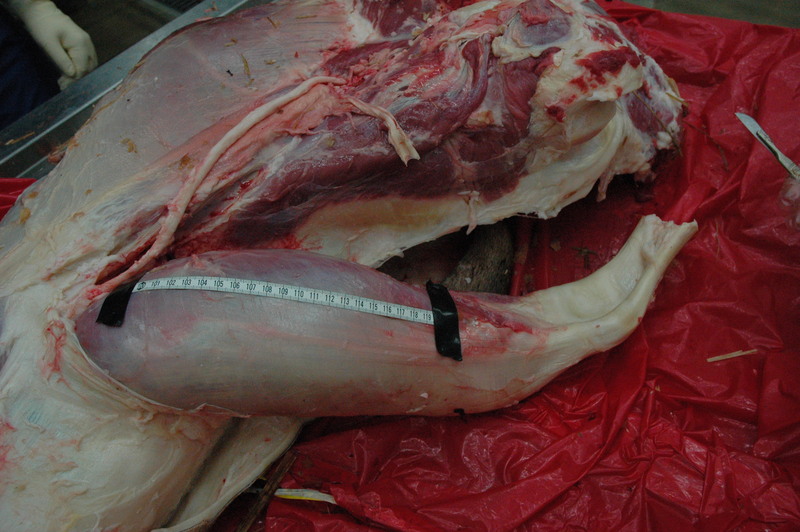 Longitudinal slice thru the biceps of an elephant, showing the internal tendon that helps identify where the two bellies of the biceps fuse. Giraffe biceps cut away proximally to show the “stay apparatus” around the shoulder joint (upper right). Zooming in on the “stay apparatus”; now in proximal view, with the biceps tendon on the left and the humeral head (showing some arthritic damage) on the right, with the groove for the biceps in between. 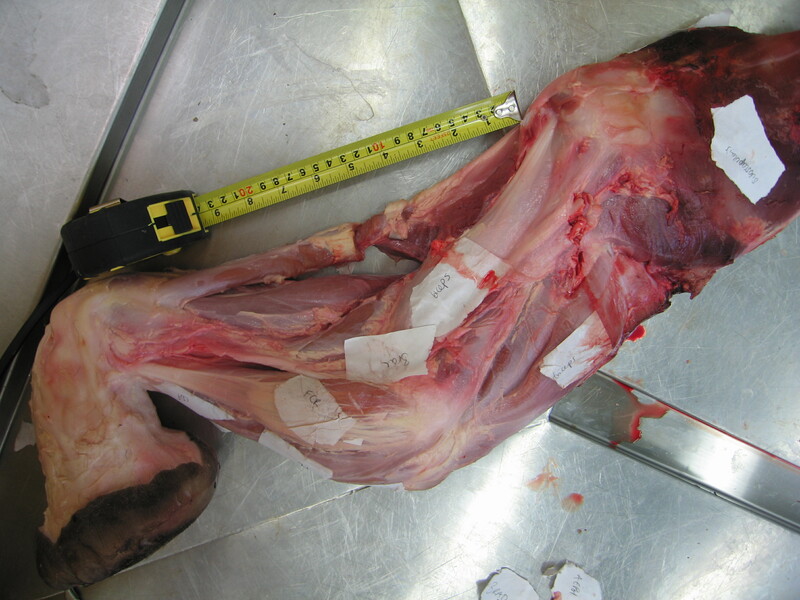 Hippo’s humerus (upper left) and biceps muscle cut away proximally, displaying the same sort of “stay apparatus” as in the giraffe. Again, note the stout proximal and distal tendons of the biceps. The proximal tendon fits into the groove of the humerus on the far left side of the image; becoming constrained into a narrow circular “tunnel” there. It’s neat to dissect that region because of its fascinating relationships between bone and soft tissues. The biceps brachii, in those mammals with a stay apparatus, seems to me to have a larger tendon overall, especially around the shoulder, and that helps brace the shoulder joint from extending (retracting) too far backward, whilst also transmitting passive tension down the arm to the forearm, and bracing the elbow (as well as distal joints via other muscles and ligaments). It’s a neat adaptation whose evolution still needs to be further inspected. Otherwise, I shouldn’t say this but the biceps is sort of boring, anatomically. Whether you’re a lizard, croc, bird or mammal, a biceps is a biceps is a biceps; more or less-ceps. But the biceps still has a clear evolutionary history and Darwin would gladly flex his biceps to raise a pint in toast to it. So now we know a muscle better. That’s two muscles now. And that is good; be you predator or prey. Let’s shake on it! 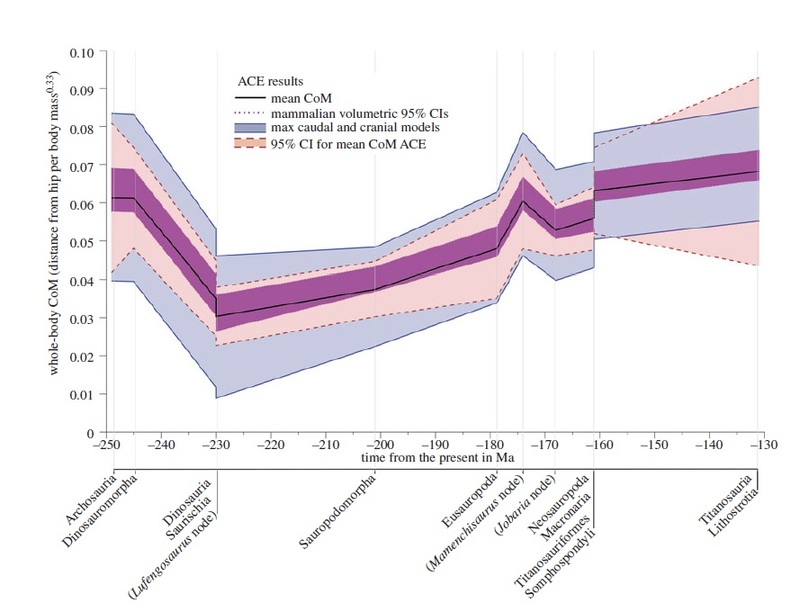 Stomach-Churning Rating: 1/10; just bones and data plots! It is often said that all cats are very similar in terms of their skeletal morphology (“a cat is a cat is a cat”). But is this really the case? It may be if only gross, qualitative anatomy is taken into consideration, i.e., if you just eyeball the skeletons of tigers and lions you might find yourself not knowing which one is which. But with huge advances in technology that allows for extracting detailed shape information off a structure (e.g., a skull) and for analysing this information (‘Geometric Morphometrics’), it has become more and more possible to distinguish between relatively similar forms – which may be from distinct species, separate sexes, or even just different populations of the same taxon. 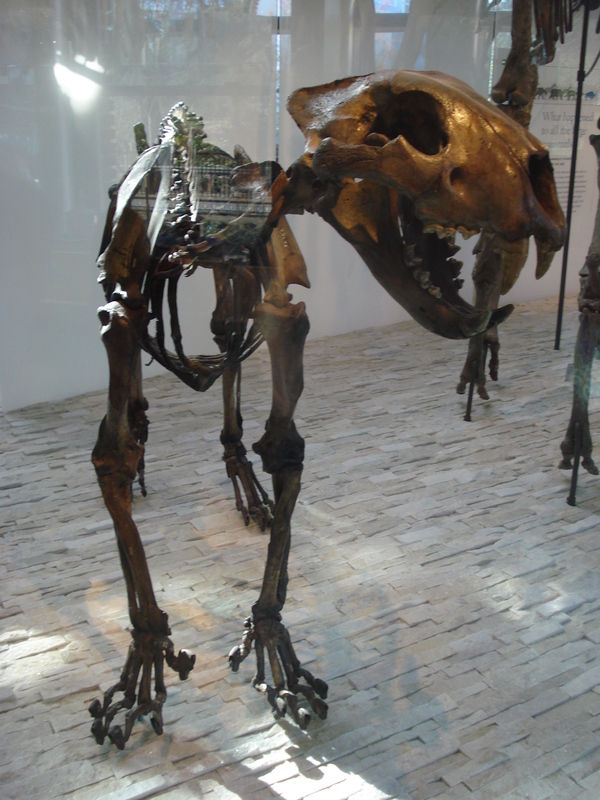 And it is reasonable to think that cat skeletons might be a lot more different than what meets the eye, as for a lineage of apparently similarly built animals, with not that much variation in diet (all cats are hypercarnivores) there is substantial variation in body mass (over 300-fold just in living species!) 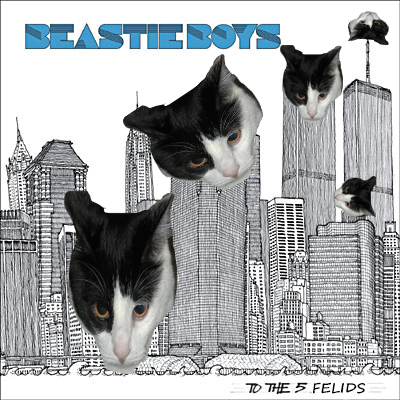 and in ecology across cat species. From the cursorial cheetah to the arboreal clouded leopard, felids present a wide range of locomotory adaptations. Yes, all cats can climb, but some do it better than others: think lion versus margay (yes, they do descend trees head-first). As hypercarnivores, all cats are meat specialists, but they also change with regards to how big their prey is, with a general and sometimes-not-so-black-and-white three-tier classification into small, mixed and large prey specialists. The rule of thumb is ‘if you are lighter than ~20-25 kg, hunt small stuff. If you are heavier than that, hunt BIG BIG things; bigger than yourself. And if you are in the middle ground, hunt some small-ish things, some big-ish things, and things about your size. Well, -ish’ – their prey size preference has a lot to do with energetic constraints (have a look at Carbone et al. 1999; and Carbone et al. 2007, if you’re interested in this). But the fun bit here is that form sometimes correlates quite strongly with function, so we should be able to find differences in some of their bones that carry this ecological signal. Indeed, for a while now, we have known that the shape of the skull and limbs of felids can tell us a lot about how they move and how big their prey is (Meachen-Samuels and Van Valkenburgh 2009, 2009), but a large proportion of their skeleton has been largely ignored: we don’t know half as much about ecomorphology and evolution of the vertebral column. Well, it was time we changed this a bit! As the PhD student in the Leverhulme-funded ‘Walking the cat back’ (or more informally, “Team Cat”) project, I’ve spend a big chunk of my first two years travelling around the world (well, ok, mainly to several locations in the USA) carrying a heavy pellet case containing my working tool, a Microscribe, to collect 3-D landmarks (Fig. 1) across the presacral vertebral column of several cat species. And some of first results are just out! 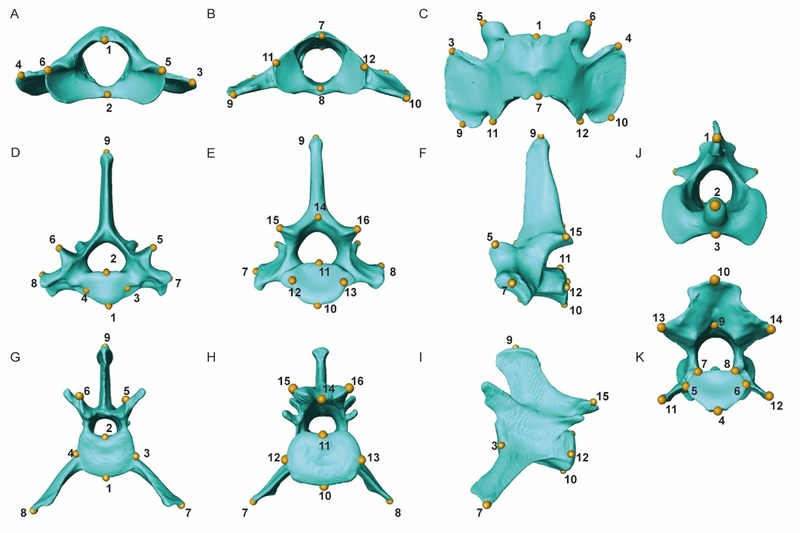 Check them out by reading our latest paper, “Regional differentiation of felid vertebral column evolution: a study of 3D shape trajectories” in the Organisms Diversity and Evolution journal (Randau, Cuff, et al. 2016). Building from results based on our linear vertebral data from the beginning of the year (Randau, Goswami, et al. 2016), the 3-D vertebral coordinates carry a lot more information and we were able to describe how this complex shape-function relationship takes place throughout the axial skeleton (in cats at least) in much better detail than our prior study did. One of the difficulties in studying serial structures such as the vertebral column is that some clades present variation in vertebral count which makes it less straightforward to compare individual vertebrae or regions across species. However, mammals are relatively strongly constrained in vertebral count, and Felidae (cats; living and known fossils) show no variation at all, having 27 presacral vertebrae. So adaptation of the axial skeleton in mammals has been suggested to happen by modification of shape rather than changes in vertebral number. Using a variety of geometric morphometric analyses, under a phylogenetically informative methodology, we have shown that there is clear shape and functional regionalisation across the vertebral column, with vertebrae forming clusters that share similar signal. Most interestingly, the big picture of these results is a neck region which is either very conservative in shape, or is under much stronger constraints preventing it from responding to direct evolutionary pressures, contrasting with the ‘posteriormost’ post-diaphragmatic tenth thoracic (T10) to last lumbar (L7) vertebral region, which show the strongest ecological correlations. We were able to analyse shape change through functional vertebral regions, rather than individual vertebrae alone, by making a novel application of a technique called the ‘Phenotypic Trajectory Analysis’, and demonstrated that the direction of vertebral shape trajectories in the morphospace changes considerably between both prey size and locomotory ecomorphs in cats, but that the amount of change in each group was the same. It was again in this T10-L7 region that ecological groups differed the most in vertebral shape trajectories (Fig. 2). Figure 2: Phenotypic trajectory analysis (PTA) of vertebrae in the T10 – L7 region grouped by prey size (A) and locomotory (B) categories. So in the postcranial morphology of cats can be distinguished, changing its anatomy in order to accommodate the different lifestyles we see across species. But the distinct parts of this structure respond to selection differently. The next step is figuring out how that might happen and we are working on it. 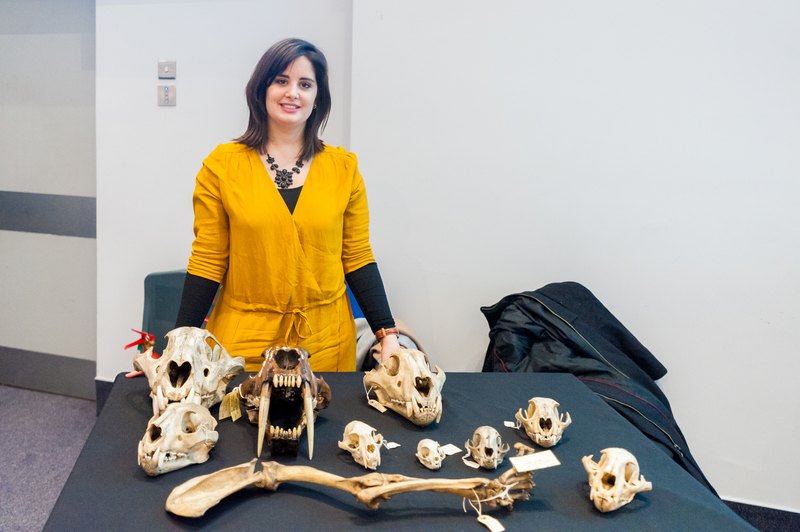 While Team Cat continues to investigate other biomechanical and evolutionary aspects of postcranial morphology in this interesting family, we’ve been able to discuss some of these and other results in a recent outreach event organised by the University College of London Grant Museum of Zoology and The Royal Veterinary College. We called it “Wild Cats Uncovered: movement evolves”. 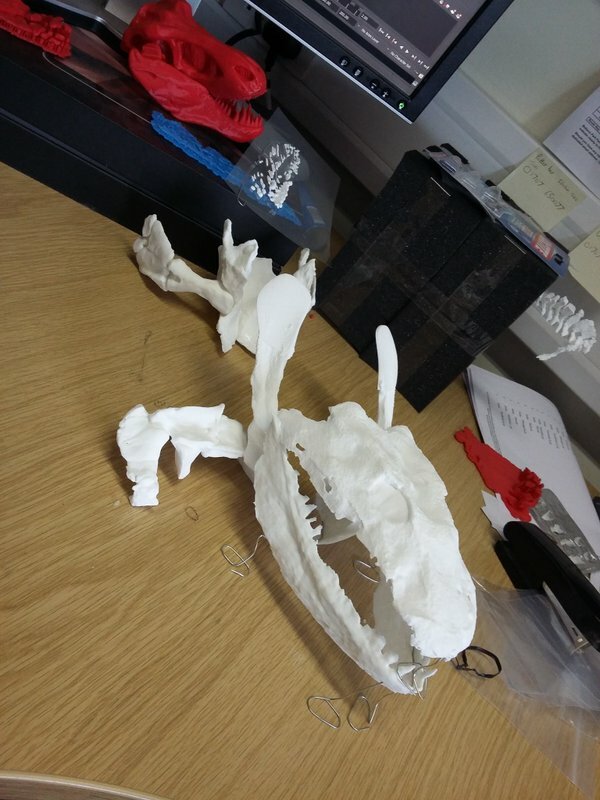 Check how it went here: (https://blogs.ucl.ac.uk/museums/2016/11/17/cheetah-post-mortem/) and here (http://www.rvc.ac.uk/research/research-centres-and-facilities/structure-and-motion/news/wild-cats-uncovered), with even more pics here (https://www.flickr.com/photos/144824896@N07/sets/72157676695634065/). Carbone, C., Mace, G. M., Roberts, S. C., and Macdonald, D. W. 1999. Energetic constaints on the diet of terrestrial carnivores. Nature 402:286-288. Carbone, C., Teacher, A., and Rowcliffe, J. M. 2007. The costs of carnivory. PLoS biology 5 (2):e22. Meachen-Samuels, J. and Van Valkenburgh, B. 2009. Craniodental indicators of prey size preference in the Felidae. Biol J Linn Soc 96 (4):784-799. ———. 2009. Forelimb indicators of prey-size preference in the Felidae. Journal of morphology 270 (6):729-744. Randau, M., Cuff, A. R., Hutchinson, J. R., Pierce, S. E., and Goswami, A. 2016. 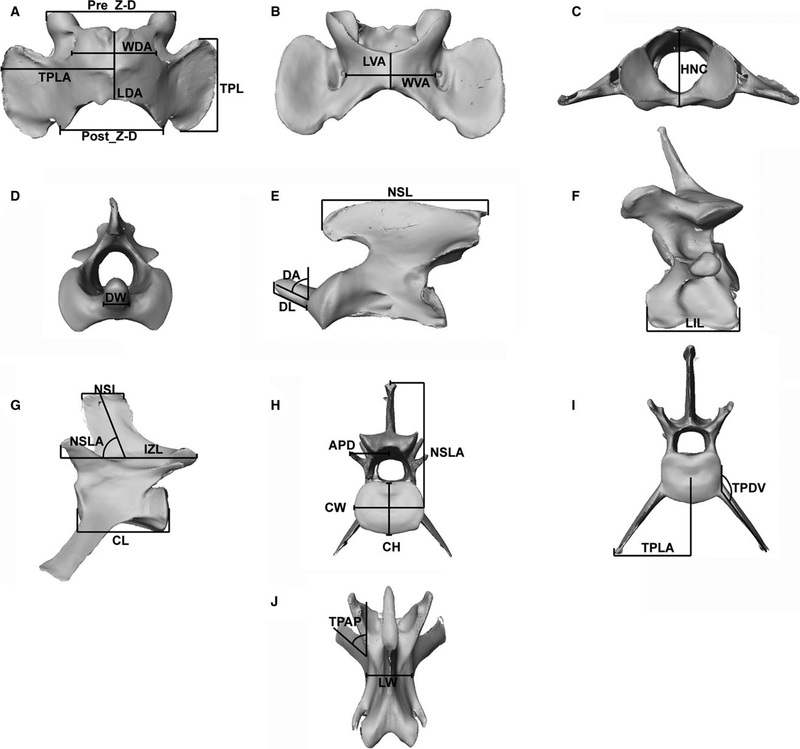 Regional differentiation of felid vertebral column evolution: a study of 3D shape trajectories. Organisms Diversity and Evolution Online First. Randau, M., Goswami, A., Hutchinson, J. R., Cuff, A. R., and Pierce, S. E. 2016. Cryptic complexity in felid vertebral evolution: shape differentiation and allometry of the axial skeleton. Zoological Journal of the Linnean Society 178 (1):183-202. It has been almost three months since my last post here, and things have fallen quiet on our sister blog Anatomy to You, too. I thought it was time for an update, which is mostly a summary of stuff we’ve been doing on my team, but also featuring some interesting images if you stick around. The relative silence here has partly been due to me giving myself some nice holiday time w/family in L.A., then having surgery to fix my right shoulder, then recovering from that and some complications (still underway, but the fact that I am doing this post is itself evidence of recovery). Stomach-Churning Rating: 4/10; semi-gruesome x-rays of me and hippo bits at the end, but just bones really. So my priorities shifted to those things and to what work priorities most badly needed my limited energy and time. I’ve also felt that, especially since my health has had its two-year rough patch, this blog has been quieter and less interactive than it used to be, but that is the nature of things and maybe part of a broader trend in blogs, too. My creative juices in terms of social media just haven’t been at their ~2011-2014 levels but much is out of my control, and I am hopeful that time will reverse that trend. Enough about all this. I want to talk about science for the rest of this post. My team, and collaborators as well, have published six recent studies that are very relevant to this blog’s theme- how about we run through them quickly? OK then. Panagiotopoulou, O., Pataky, T.C., Day, M., Hensman, M.C., Hensman, S., Hutchinson, J.R., Clemente, C.J. 2016. Foot pressure distributions during walking in African elephants (Loxodonta africana). Royal Society Open Science 3: 160203. Our Australian collaborators got five African elephants together in Limpopo, South Africa and walked them over pressure-measuring mats, mimicking our 2012 study of Asian elephants. While sample sizes were too limited to say much statistically, in qualitatively descriptive terms we didn’t find striking differences between the two species’ foot pressure patterns. I particularly like how the centre of pressure of each foot (i.e. abstracting all regional pressures down to one mean point over time) followed essentially the same pattern in our African and Asian elephants, with a variable heelstrike concentration that then moved forward throughout the step, and finally moved toward the outer (3rd-5th; especially 3rd) toes as the foot pushed off the ground, as below. 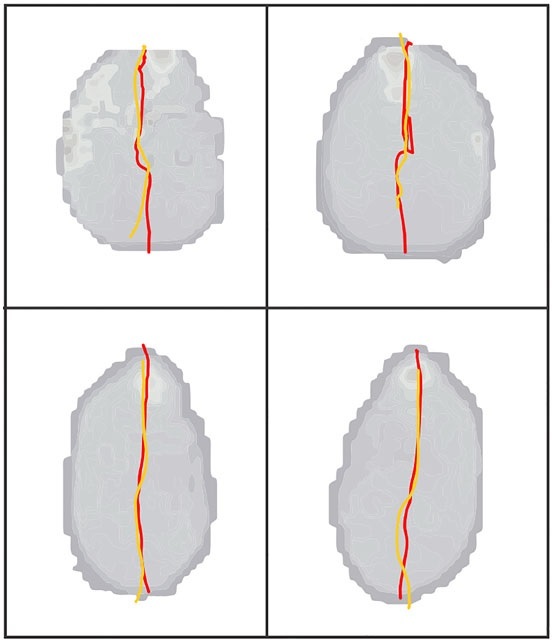 African elephant foot COP traces vs. time in red; Asian elephant in orange-yellow. Left and right forefeet above; hindfeet below. Gradually, this work is moving the field toward better ability to use similar techniques to compare elephant foot mechanics among species, individuals, or over time– especially with the potential of using this method (popular in human clinical gait labs) to monitor foot (and broader musculoskeletal) health in elephants. I am hopeful that a difference can be made, and the basic science we’ve done to date will be a foundation for that. Panagiotopoulou, O., Rankin, J.W., Gatesy, S.M., Hutchinson, J.R. 2016. A preliminary case study of the effect of shoe-wearing on the biomechanics of a horse’s foot. PeerJ 4: e2164. 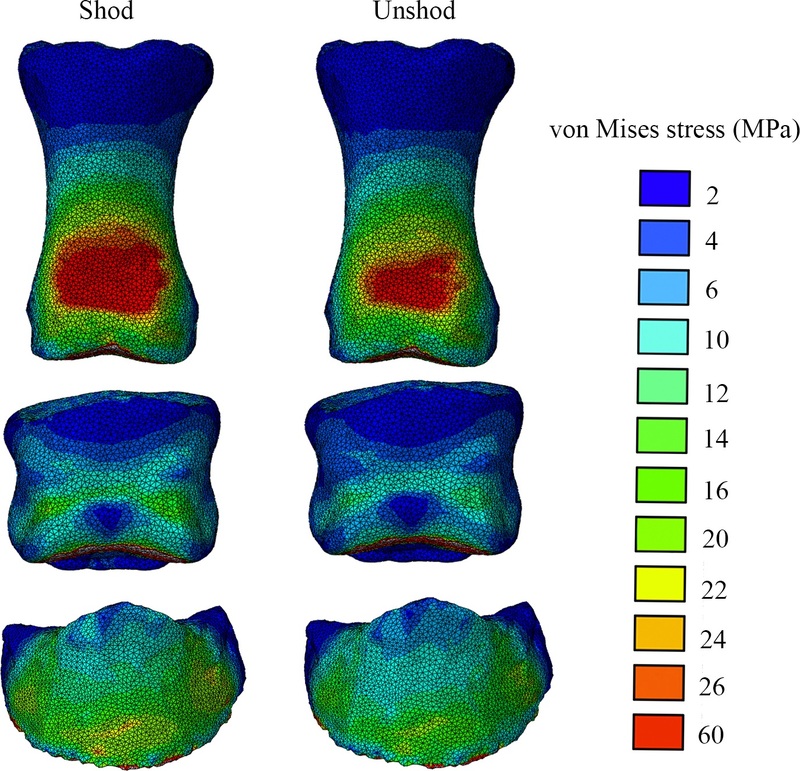 Above: The toe bones (phalanges) of our horse’s forefoot in dorsal (cranial/front) view, from our FEA results, with hot colours showing higher relative stresses- in this case, hinting (but not demonstrating statistically) that wearing horseshoes might increase stresses in some regions on the feet. But more convincingly, showing that we have a scientific workflow set up to do these kinds of biomechanical calculations from experiments to computer models and simulations, which was not trivial. Bates, K.T., Mannion, P.D., Falkingham, P.L., Brusatte, S.L., Hutchinson, J.R., Otero, A., Sellers, W.I., Sullivan, C., Stevens, K.A., Allen, V. 2016. Temporal and phylogenetic evolution of the sauropod dinosaur body plan. Royal Society Open Science 3: 150636. Randau, M., Goswami, A., Hutchinson, J.R., Cuff, A.R., Pierce, S.E. 2016. Cryptic complexity in felid vertebral evolution: shape differentiation and allometry of the axial skeleton. Zoological Journal of the Linnean Society 178:183-202. Example measurements taken on felid vertebrae, from the neck (A-F) to the lumbar region (G-J), using a cheetah skeleton. Charles, J.P., Cappellari, O., Spence, A.J., Hutchinson, J.R., Wells, D.J. 2016. 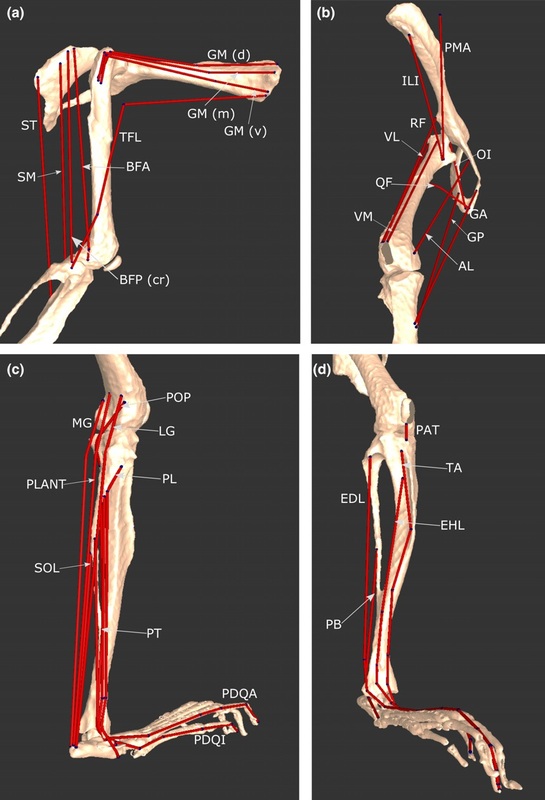 Musculoskeletal geometry, muscle architecture and functional specialisations of the mouse hindlimb. PLOS One 11(4): e0147669. RVC PhD student James Charles measured the heck out of some normal mice, dissecting their hindlimb muscle anatomy, and using microCT scans produced some gorgeous images of that anatomy too. In the process, he also quantified how each muscle is differently specialized for the ability to produce large forces, rapid contractions or fine control. Those data were essential for the next study, where we got more computational! Charles, J.P., Cappellari, O., Spence, A.J., Wells, D.J., Hutchinson, J.R. 2016. Muscle moment arms and sensitivity analysis of a mouse hindlimb musculoskeletal model. Journal of Anatomy 229:514–535. 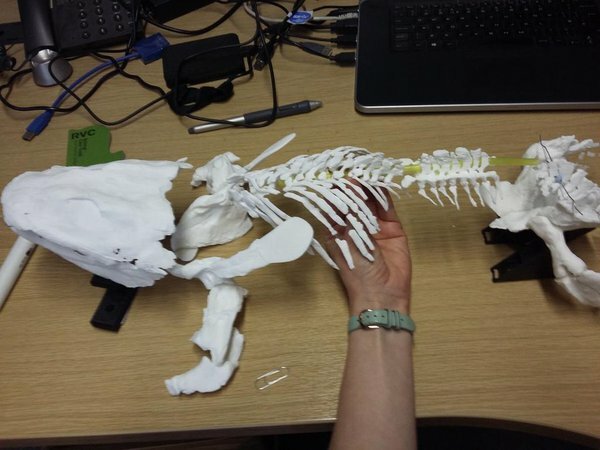 James wrangled together a lovely musculoskeletal model of our representative mouse subject’s hindlimb in the SIMM software that my team uses for these kinds of biomechanical analyses. As we normally do as a first step, we used the model to estimate things that are hard to measure directly, such as the leverages (moment arms) of each individual muscle and how those change with limb posture (which can produce variable gearing of muscles around joints). James has his PhD viva (defense) next week so good luck James! The horse and mouse papers are exemplars of what my team now does routinely. 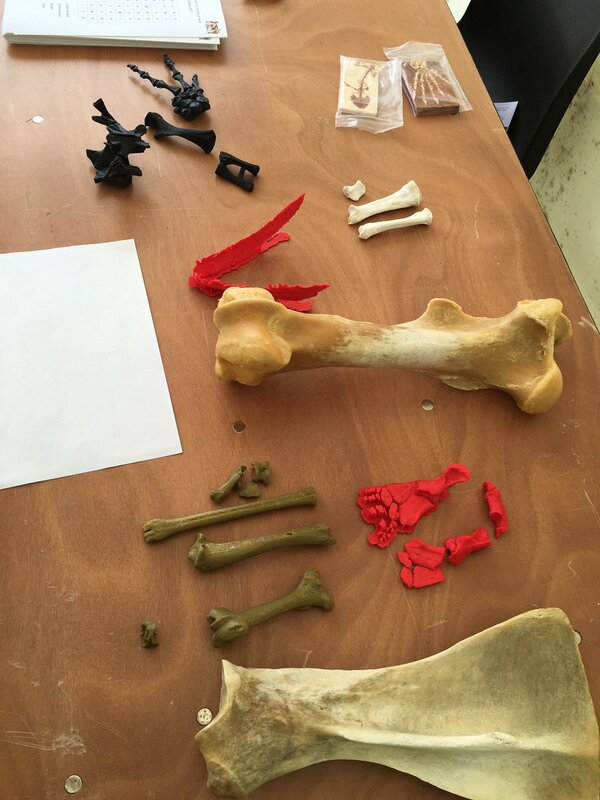 For about 15 years now, I’ve been building my team toward doing these kinds of fusion of data from anatomy, experimental biomechanics, musculoskeletal and other models, and simulation (i.e. estimating unmeasurable parameters by telling a model to execute a behaviour with a given set of criteria to try to perform well). 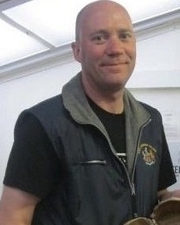 Big thanks go to collaborator Jeff Rankin for helping us move that along lately. Our ostrich study from earlier this year shows the best example we’ve done yet with this, but there’s plenty more to come. I am incredibly excited that, now that my team has the tools and expertise built up to do what I’ve long wanted to do, we can finally deliver the goods on the aspirations I had back when I was a postdoc, and which we have put enormous effort into pushing forward since then. In addition to new analyses of horses and mice and other animals, we’ll be trying to push the envelope more with how well we can apply similar methods to extinct animals, which brings new challenges– and evolutionary questions that get me very, very fired up. Here we are, then; time has brought some changes to my life and work and it will continue to as we pass this juncture. I suspect I’ll look back on 2016 and see it as transformative, but it hasn’t been an easy year either, to say the least. “Draining” is the word that leaps to mind right now—but also “Focused” applies, because I had to try to be that, and sometimes succeeded. I’ve certainly benefited a lot at work from having some talented staff, students and other collaborators cranking out cool papers with me. I still have time to do other things, too. Once in a while, a cool critter manifests in The Freezers. Check out a hippo foot from a CT scan! 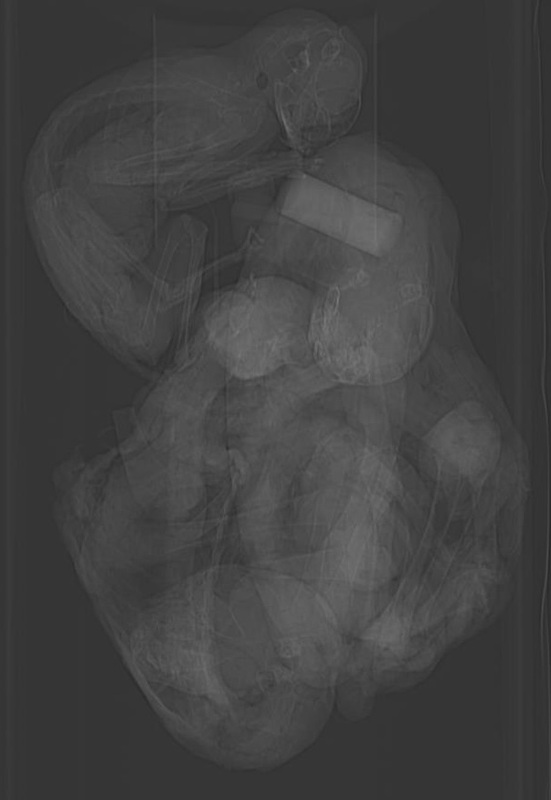 It’s not my best scan ever (noisy data) but it shows the anatomy fairly well, and some odd pathologies such as tiny floating lumps of mineralized soft tissue here and there. Lots to puzzle over. I’ve described our “Walking the Cat Back” Leverhulme Trust-funded project with Dr. Anjali Goswami and colleagues before, but today we really got stuck into it. 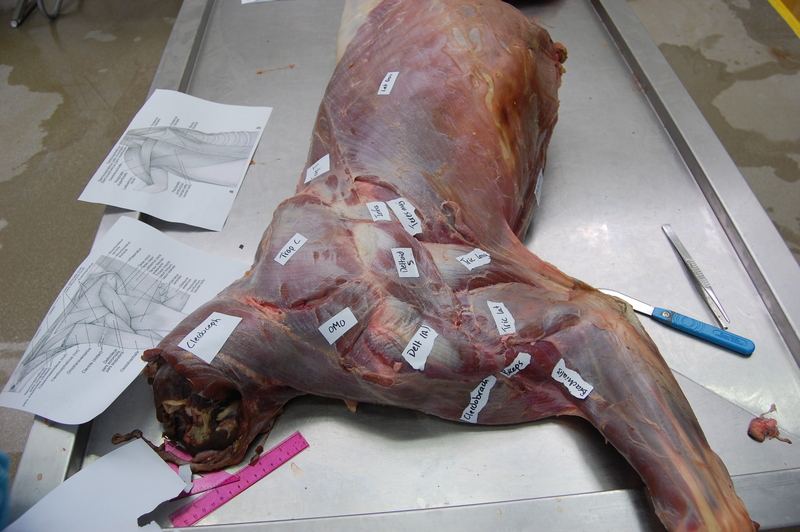 We’re dissecting a 46kg male Snow Leopard (Panthera uncia) as the first “data point” (actually several hundred data points, but anyway, first individual) in our study of how limb and back muscles change with size in felids. No April Fools’ pranks here; real science-as-it-happens. Stomach-Churning Rating: 7/10 for skinned leopard and globs of fat. Much worse in person, hence the downgrading from what could be a higher score. Don’t click the photos to emkitten them if you don’t want to see the details. This leopard is the same one that Veterinary Forensics blogged about. It died in a UK cat conservation/recovery centre. 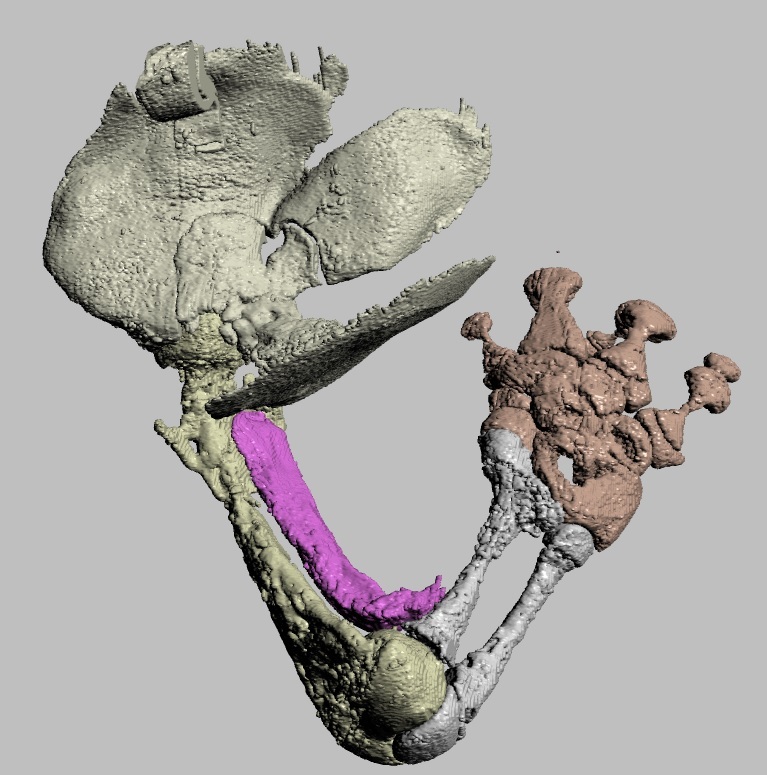 Today is simply a short post, but it is the first in what will surely be a continued series of posts on felid postcranial anatomy and musculoskeletal biomechanics by our felid research team, with bits of natural history and evolution thrown in when we can manage. As befits one of my curt “Anatomy Vignette” posts, pictures will tell the story. 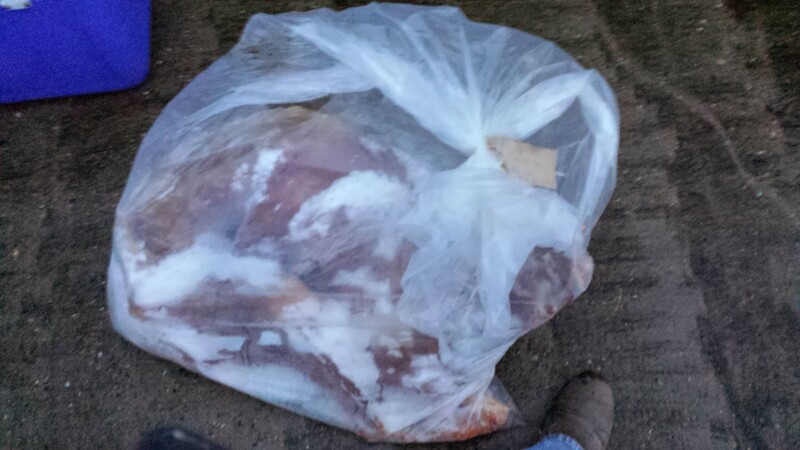 Skinned and mostly de-fatted snow leopard, with fat piled up on the lower left hand corner near the hind feet. Here we are identifying and then removing and measuring the individual muscles. 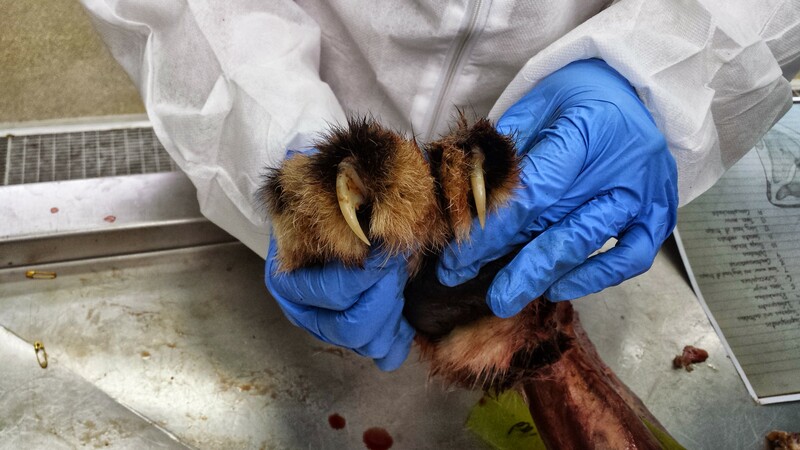 Project postdoc Andrew Cuff is hard at work on the forelimb while I’m mucking around with the hindlimb. 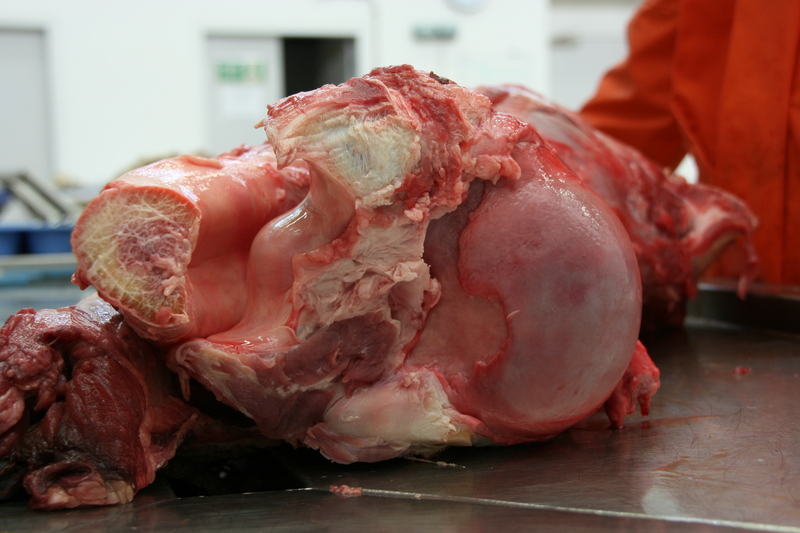 The fat here is about 3kg subcutaneous fat, so around 6.5% of body mass. And as the cat has been around for a while, that fat has gone a bit rancid and that is not nice. Not nice at all, no… Usually smells do not bother me, but this took some adjustment. 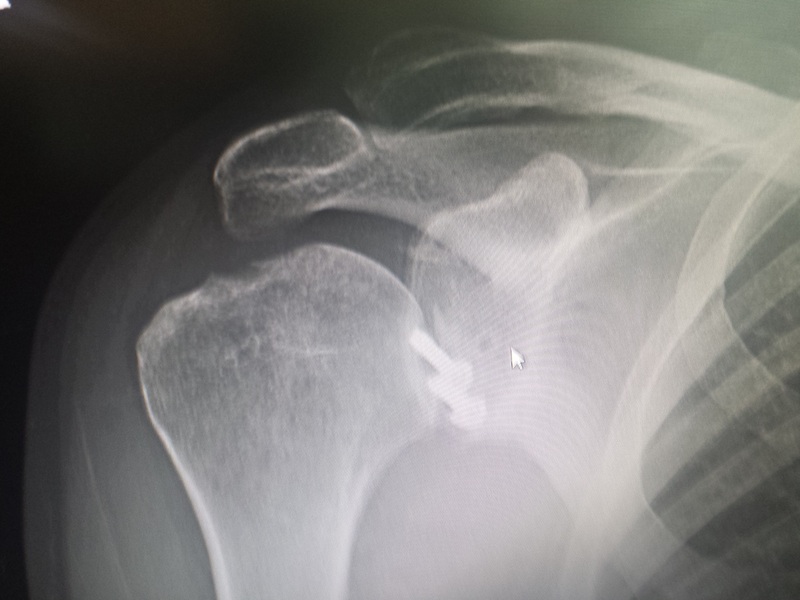 Fortunately, the muscles are still OK, and work is coming along well. 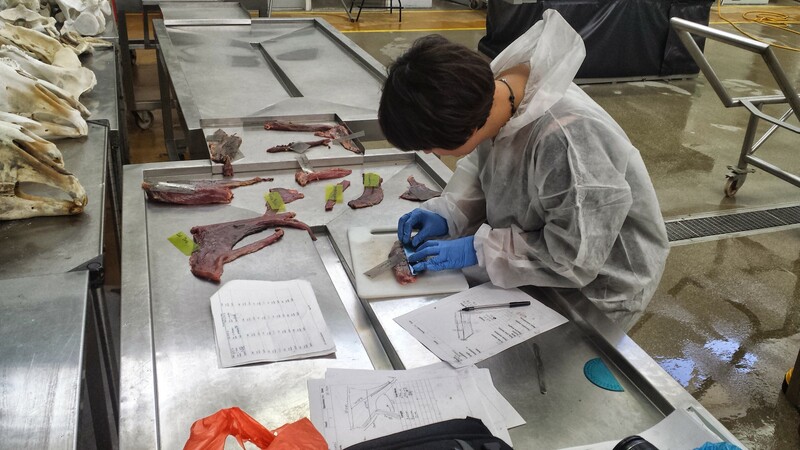 UCL PhD student Marcela Randau, carving up our cat’s limb muscles. As usual in comparative biomechanics, we measure the “architecture”- parameters of the muscle that relate in a somewhat straightforward fashion to function. This muscular architecture includes things like muscle mass, the lengths of the fibers (fascicles) that make up the muscles, and the angle of the fascicles to the muscle’s line of action. These parameters correlate reasonably well with the force and power that the muscle can develop, and its working range of length change. Other posts here have discussed this more, but by measuring the architecture of many muscles in many felids of different sizes, we can determine how felids large and small adapt their anatomy to support their bodies and move their limbs. This will help to solve some lingering mysteries about the odd ways that cats move and how their movement changes with body size. This research is being driven forward mainly by Andrew and Marcela, shown above, so I wanted to introduce them and our odoriferous fat cat. 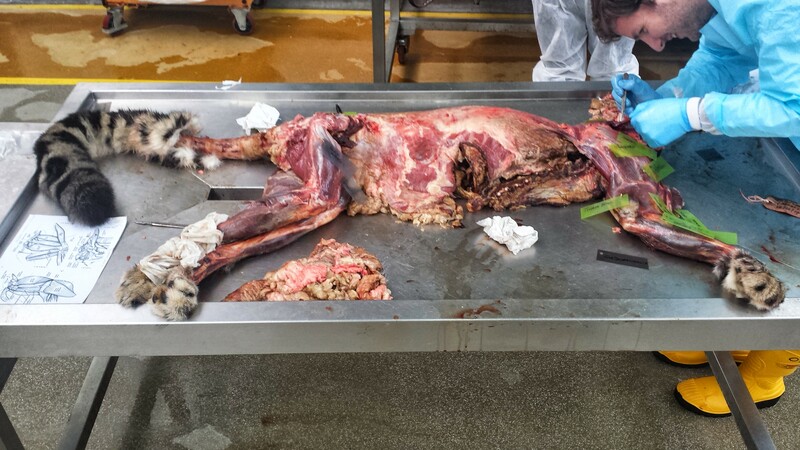 Upcoming dissections: 1-2 more snow leopards, tiger, various lions, ocelot, black-footed cat, leopard, and a bunch of moggies, and whatever else comes our way. All were EU zoo/park mortalities (there are a LOT of big cats out there!). EDIT: Had to add a photo of the CLAWS! Whoa dude. So in my last post I promised to put up the videos of my cat biomechanics footage online (cut scene from “The Secret Life of the Cat” documentary). Here I deliver on that promise. Note that all this footage was filmed at 250 frames/second, so it is 10 times faster than conventional UK/EU (PAL format) video and thus it plays 10x slower if replayed at PAL format speeds. Hence it is often called “slo-mo”/slow motion video. However, most experts would call it high speed video due to the high frame rate that gives us higher temporal resolution, ideal for studying fast movements. It was cold that day; indeed the Colchester Zoo area where we filmed the tiger videos below had been snowed in earlier; so the posting of these videos on my freezer-based blog is DEFINITELY apropos. 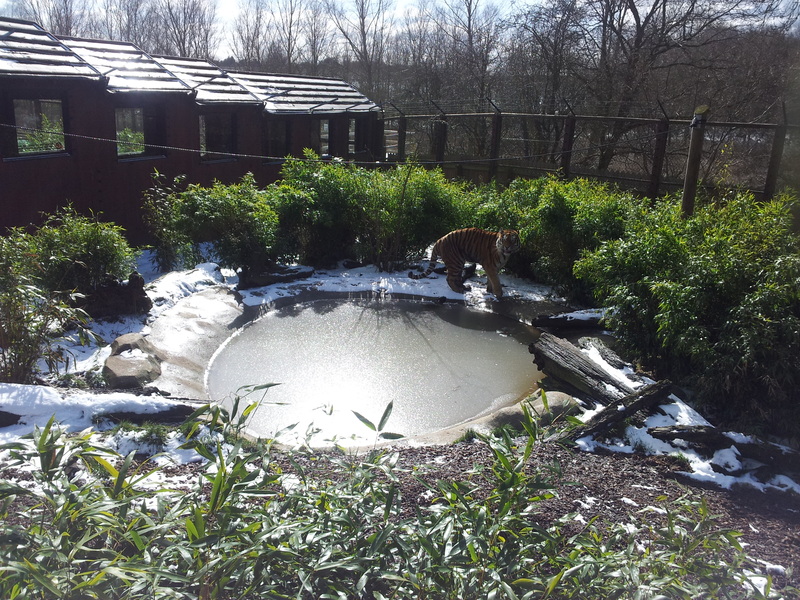 Third, a tiger whom we filmed at Colchester Zoo. It nonchalantly strolled out of its indoor enclosure upon release. No drama. It was a bit unnerved by our presence but took its time. Pretty nice! And thanks to the magic of blogging, you get to see it, rather than having it banished forever to the purgatorial cutting room floor! I turned around and he was checking me out; I was just on the other side of the fence. That was a fun surprise! 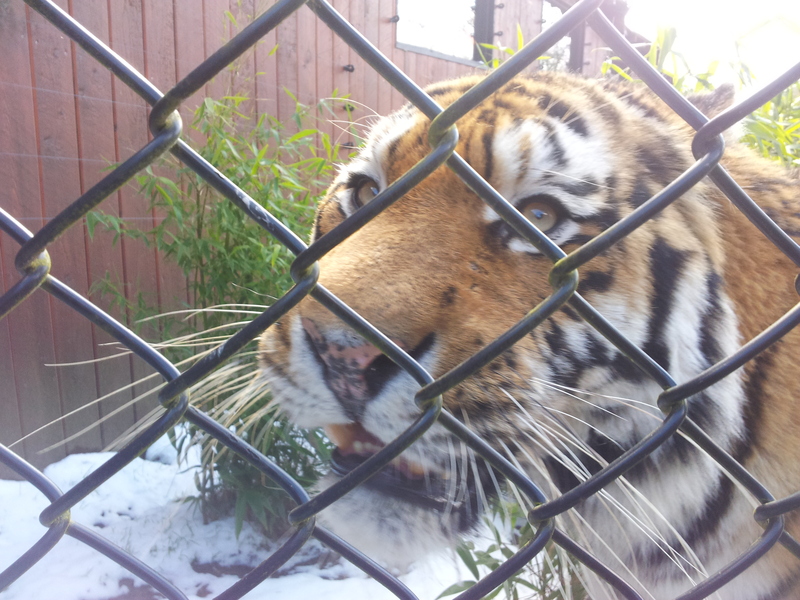 Some close-up time with a curious tiger.